The Canadian launch of the new VW Beetle has linked Paid Media placements on billboards and in print to Augmented Reality and a custom designed iPhone / iPad app. The campaign functions in two ways. 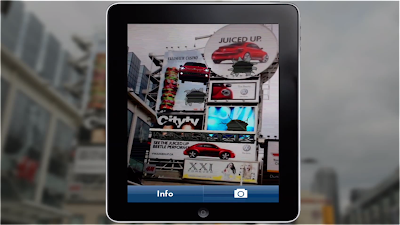 The passive audience receive a message from the Paid Media display advertising, but the active audience are able to download a new Beetle app onto their iPhone or iPad. Using the Beetle app, iPhone / iPad users can access a range of supplementary digital content that is laid over the real world imagery - creating a more impactful and more engaging ad experience. Another example of how mobile can facilitate the easy linking of Paid Media offline with digital Owned Media content. I've downloaded the beetle app into my iPAD and it works great. I love the functionality of this application. I also have a scanner application in my iPad. I love to scan photos and images that look lovely and impressive. Technology really gives the best possibilities at our hands. You could make use of the application on any kind of Snapchat Sign Up the Snapchats you've screenshotted or saved money on your tool.